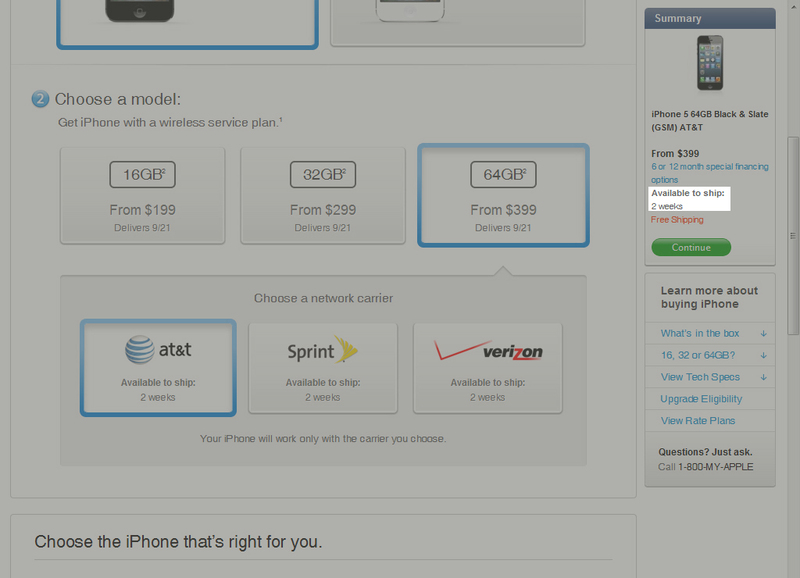 iPhone 5 ship dates pushed back to 2 weeks 1 hour after going on pre-sale | When Will Apple? UPDATE 4:40 AM EST Hearing reports of people having luck still ordering direct from carriers. Good luck! This has to be a new record right!?! I heard reports of this, but I was still seeing the immediate ship date. I opened a Google Chrome incognito browser and check again and saw the 2 weeks that was being reported. So I guess I had some kind of special session open that was showing me the other date, but who knows if that would have actually worked. Luckily for me I already placed my order! UPDATE No, tried ordering for a friend thorugh my session, but still showing 2 weeks on the final order. I can only imagine how the lines are going to be at the stores on the 21st for this very disappointing iPhone update.